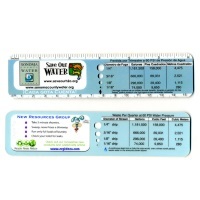 Fully Customize the water ruler with your logo and message, printed right on the ruler now in full color! Water ruler with die cut drip gauge. Measure the diameter of a drip to know how much water is being wasted over a three month period. Save water in the summer, use this handy tool for measuring water loss with the die cut drip gauge, 6" ruler for measuring in cm and inches. Handy tips printed on the back. Lightweight and laminated. Measures 6" / 15 cm. Price includes color custom print & art layout and set-up.